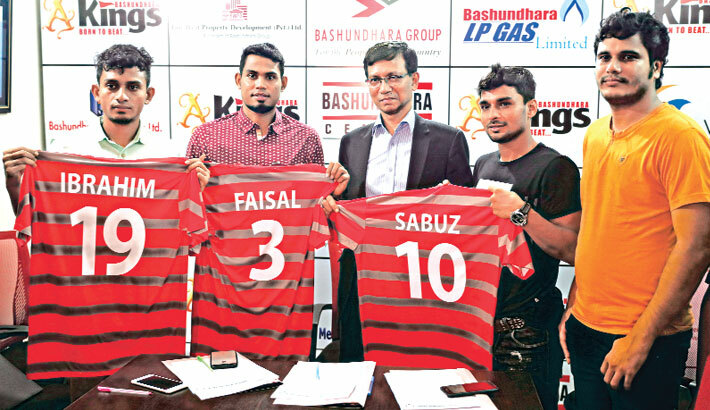 Bashundhara Kings officially started their player transfer formalities for upcoming prestigious Bangladesh Premier League (BPL) 2018. The contracts were signed amid much fanfare and enthusiasm at Bashundhara Kings Headquarters in Bashundhara Residential Area on Sunday. Kings inked the contract papers with midfielder Towhidul Alam Sabuj, defender Nurul Nayeem Faisal and midfielder Mohammad Ibrahim during the signing ceremony. As part of free transfer regime, the players were signed in. Sabuj and Nurul played for Chittagong Abahani in the BPL 2017 while Ibrahim was part of Saif Sporting setup. Bashundhara Kings retained two of their players from their Bangladesh Championship League 2017 campaign as binding players. Md Imrul Hassan and Rakibul Hasan Tushar were retained based on their performance in the BCL. But domestic star Towhidul Alam Sabuj will be the heart of Kings’ attack. The top Bangladeshi scorer of last two season of BPL, Sabuj, was the stalwart of Chittagong Abahani and Dhaka Mohammedan in past iterations of the league. This will be Kings’ maiden appearance in BPL. Earlier on the day, nine youngsters were awarded Yes Cards as part of the second phase of Bashundhara Kings Under-17 trial. The second phase is divided into six sections of which four have been completed. BPL transfer window opened on July 25 ahead of the upcoming season of the country’s top league. A total of 13 clubs will be participating in the competition. Domestic player recruitments are to begin on July 25 and will go on till August 30 while the process of recruiting foreign players will go on from July 25 to October 15. Bangladesh Premier League 2018 will commence on November 23, 2018 and go on till the last week of May 2019. Bangladesh became the latest member association to adopt Asian Football Confederation’s 3+1 rule which will allow clubs to recruit one player of Asian origin in addition to their regular quota of three foreigners. Bangladesh Football Federation executive committee decided to embrace the new AFC rule which encourages the mobility of talented Asian players and provides a boost to the game regionally.